The 1st annual Satake Estates Halloween Party was great fun and a huge success.Â Â The new residents had a potluck block party and the food was really scary, with eyeballs in the cheese platter and wriggly worms in the chocolate cake. 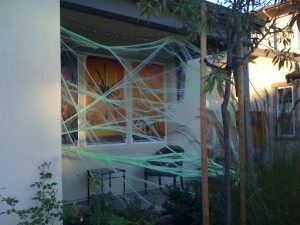 The frightening green spiderweb only got the party started, click here to view more photos from the party. Some highlights of the evening were the Isaacson Family who were very convincing in their Stars Wars theme.Â Â At one point though, Darth Vader was outnumbered and had to surrender. The scariest house definitely goes to the Vedovato family who went to town transforming their porch with huge spiders, and freakish ghosts and ghouls. The residents enjoyed getting to know each other while the kiddies made new friends, charging around the cul â€“de â€“sac with swords and sabers using super human strength and magical powers. If you’re ready to join in the fun at the next block party, you best hurry to Satake Estates as time is running out to own a new home at Satake Estates.